As part of our founding purpose to honor the American Armed Forces, which sacrifice life and limb to defend our country, Freedom Alliance is committed to provide scholarships to the children of our fallen heroes. Not only do we establish provision to offset the cost of college tuition, we also pride ourselves on creating a relationship with the students we help. One of the ways we do that is to organize a Scholarship Fund Student Retreat. To complement the forthcoming Father’s Day weekend, we selected eight of our scholarship recipients, whose fathers were killed in action during combat operations or training accidents, to join us for a moving and yet entertaining get-away to Washington, D.C.
For these young people, finding peer support in academia as well as opportunities to recognize their fathers’ sacrifices might be tough. We think the Scholarship Fund Student Retreat meets both these needs rather nicely. Coming from colleges across the country on a Friday evening, the eight students met with a team from Freedom Alliance, enjoyed a nice dinner, and then sampled the D.C. nightlife. The following morning began with a proper breakfast and a kind of psychological steeling for what was next on the itinerary. 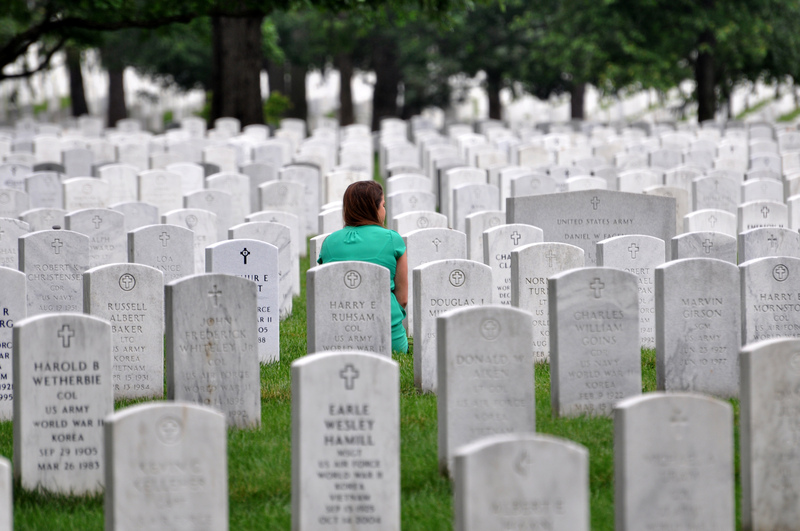 The main event during our retreat weekend is a poignant trip to Section 60 at Arlington Cemetery, where most of the students’ fathers are interred. This year we stopped to buy flowers on the way. Zach’s sister had asked for a picture of their father’s gravesite. Army Sergeant First Class Randall R. Oler was killed during a pre-deployment training exercise at Fort Bragg in 2004. The young folks made their way among the stones to find the name they came to see. We allowed them their time to privately remember, but eventually they wanted company, so we sat together and listened as they processed the experience. 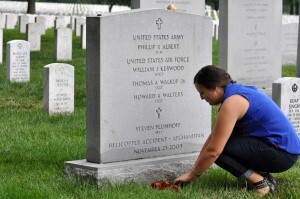 For Kalie, this was her first visit to Arlington Cemetery since her father’s funeral. Air Force Sergeant Howard Walters was killed in 2003 in a helicopter crash during hostile action in Afghanistan. During our time at the graves, we picked up another scholarship student who was late to join us. Christina is a recent graduate and engaged to marry a soldier who is currently serving in Afghanistan. Her father, Army Chief Warrant Officer Richard Salter, was an Apache helicopter pilot; he was killed when his aircraft collided with another over Baghdad. Freedom Alliance supporter Tillie Smithers treated the kids to lunch at the Washington Golf and Country Club after we departed Arlington Cemetery. After a brief rest, we hopped on the Metro to go downtown. 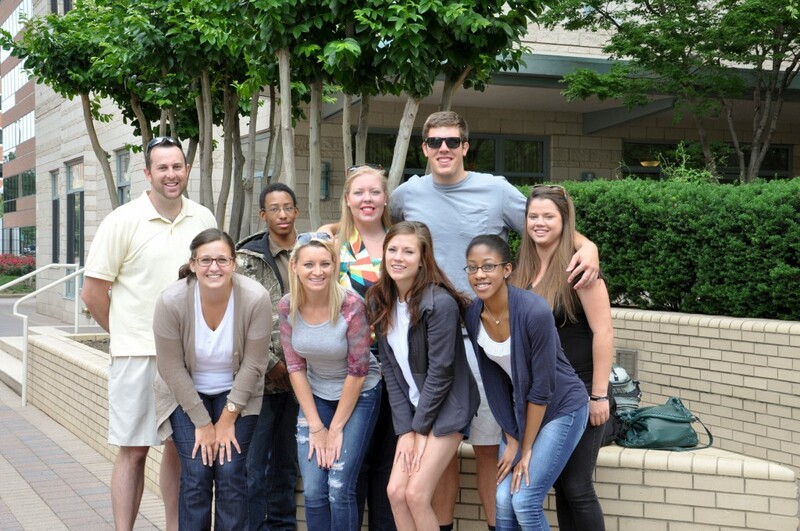 The students divided into two teams and spent a couple of hours following a photo treasure hunt. This resulted in a lot of laughs and many more silly memories. That night we reviewed the photographic results over dinner at Cheff Geoff’s. Freedom Alliance president, Tom Kilgannon, and his family stopped by too to say hello. Thoroughly exhausted, the retreat guests decided to call it a night when we reached the hotel.